George Washington Frank was born in Warsaw, NY, in 1830. His father was trained as a doctor, ran a successful mercantile and real estate business, and was a major conductor on the Underground Railroad. George and his brother, Augustus, helped run the mercantile business and invested in real estate of their own. George's brother would go on to serve as a U.S. Congressman during the Civil War and was instrumental in passing the legislation to outlaw slavery. In 1854, George Frank married Miss Phoebe McNair. Phoebe was a direct descendant of William Penn, the original proprietor of Pennsylvania. 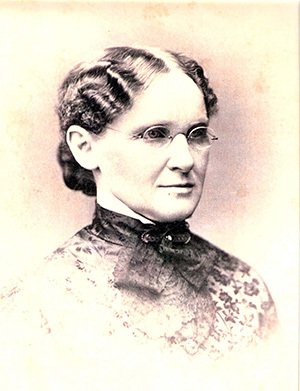 In Kearney, she served as a school teacher. Thirteen years later, Augustus Frank, George's brother, married Phoebe's sister, Agnes. George and Phoebe had four children: Sarah (1855/6, died in infancy), Augustus (b. 1857), Jeanie (b. 1859) and George William Jr. (b. 1861), the architect of the Frank House. In 1869, George moved his family west to Corning, IA, which was then the western end of the Burlington railroad line. He and his partner, Lew Darrow, bought and sold real estate in Iowa, Missouri and Nebraska. In 1873, the Franks built a lavish home in Corning and named it Edgewood. The Corning house was lost to a fire in the early 1990s. 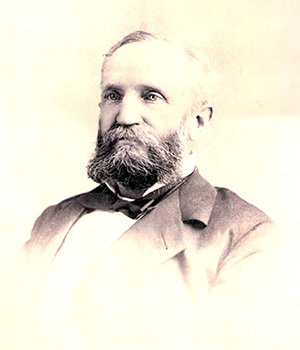 George made his first trip to the Kearney area in 1871 where he purchased 1042 acres of land from the Union Pacific railroad. George first heard about the area from his cousin, Col. W.W. Patterson, who was employed by the C.B.& Q. railroad to locate a suitable place to create a junction between the C.B. & Q. and the Union Pacific. Col. Patterson surmised that the Platte River and its underground water supplies could be used to create electrical power and irrigated farming lands. Col. Patterson with the other founding fathers of Kearney formulated the plan and began work on the Kearney Canal. George Frank invested in what became the Kearney Canal in 1885 and his company completed construction of the canal in 1886, which first produced power in the summer of 1887. The opening of the canal allowed Kearney to be transformed from the desolate prairie and small fort that George had seen in 1871 to a booming industrial town with over 100 manufacturers. The George W. Frank Improvement Company ran the power plant and canal and the electric street car system. The depression and financial panic of 1893 followed by a drought in 1894 bankrupted the Franks and much of the industry in Kearney. George Sr. now in his seventies and in poor health lost his fortune and his assets were divided among his investors. Phoebe died in February of 1900 at the age of 68. George moved in with Jeanie and her family in Lincoln, NE, where he died in 1906. He was 76 years old. The majority of the family, including George and Phoebe, are buried in Warsaw Cemetery in Warsaw, N.Y.